Le Club AccorHotels has launched new Unexpected Places offer for a stay in the Middle East between October 25 – November 25, 2016. Member can earn 2,000 bonus points for one stay minimum of two nights that is booked October 25 – November 1. Note that the page only mentions Dubai but the T&Cs do include the entire Middle East as well. 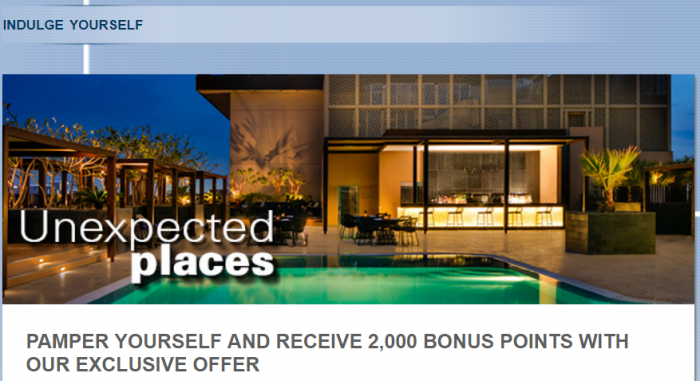 Le Club AccorHotels has quite a few promotions for stays in Middle East as of late. The occupancy rates must be on the softer side. 1. General Le Club AccorHotels terms and conditions apply to the [Unexpected Places] offer and you must be Le Club AccorHotels member to benefit from it. 2. This offer entitles Le Club AccorHotels members, regardless of their status, to benefit from earning [2,000] for a stay in one of the participating hotels in Le Club AccorHotels Loyalty program. 3. This offer is valid for a member’s stay from 25/10/2016 to 01/11/2016 in one of the participating hotels in [Middle East], and booked between 25/10/2016 and 25/11/2016. 5. Any consecutive stays (check-out and check-in same day) in the same hotel, will be considered as a single stay. This single stay will be eligible once to the [Unexpected Places] offer. 7. To benefit from this offer, your booking must be made on AccorHotels.com, our participating brands web sites, applications and via AccorHotels Call Centers, direct hotels, and GDS. 13. Please specify the reference 47491 in all your communications with AccorHotels call centers or customers care services related to this offer.